Samsung has made the official announcement for its Galaxy Note 8.0 tablet that will make its appearance in US stores tomorrow, at a starting price of $400. If you live in the US, you will be able to buy the tablet from Samsung directly, or you can buy it through Amazon, Best Buy, Newegg, Staples and not only. You will also be able to purchase accessories for the Note 8.0 but from mid-April. 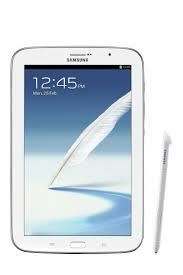 The Galaxy Note 8.0 comes preloaded with content worth of $200. This includes 50 GB of Dropbox Storage for 2 years and one free month of Music Hub streaming. Also you will get a 25$ voucher for purchases on Google Play that will be given to you when you register the tablet. Samsung also premiers its WatchON service with the Note 8.0, a digital TV Guide.